Home-grown grape plants not only produce fruit, but give shade and color to yards. According to the Ohio State University Extension, one mature and established grapevine can produce around 20 pounds of grapes per year and grow for up to 40 years. Since grapes are not self-pollinating and need the assistance of bees or other insects, companion plants are beneficial to their growing success. Companion planting provides benefits to surrounding plants. Gardeners can discourage predatory insects, attract bees for pollination and improve soil quality with companion plants for grapes. For example, place coriander and borage several feet from grape vines to attract bees to the yard to pollinate grape vines. Place companion plants between grape vines and in the surrounding area. They should be close enough to the grapes to provide benefits, without overcrowding the plants. For example, place Geranium or Rue plant varieties between grape vines, and at the ends of rows to deter Japanese beetles. Use companion plants to add nutrients to the soil for grape vine growing. These will encourage stronger vines that yield larger grape crops. For example, borage adds calcium and potassium to the soil. Clover is another companion plant that increases the soil quality and attracts bees when grown near grape vines. Aphids and beetles are common pests for grape vines. Companion plants deter these pests from overtaking an orchard. Planting chives and nasturtiums discourages aphids. Mustard plants are notorious for trapping predatory insects. Plant mustard plants at the start of the growing season and remove from the area once immature grapes start forming. Use a combination of several companion plants with grape vines for the most benefit. 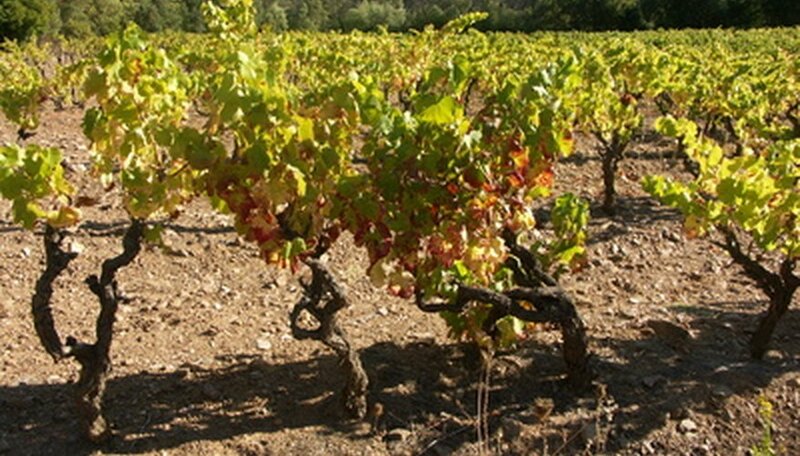 Vines grow stronger and faster while yielding larger crop volumes. Growers spend less time managing and maintaining grape vines while the companion plants do the work for them. Grape growers can use companion plants for other purposes as well. For example, use chives for seasoning foods or add nasturtium blooms to salad dishes. Cut geraniums for floating flower arrangements or clean mustard plants to enjoy mustard green recipes.